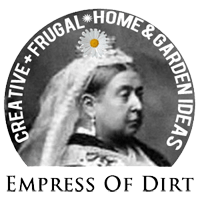 We wish to announce that Her Majesty, the Empress of Dirt, has a whole new look. Not that we didn’t love her as she was, but, after many years in the same outfit, it was time for a nice, fresh start. First, let me give you a little history. Some of you have been following my blogs from the beginning (hello!) and remember these early years. Back in the early 2000s, I had a blog called Pioneer Woman with Cell Phone. It was a place to share my love of old-fashioned life skills combined with a healthy appreciation for the usefulness and brilliance of modern inventions and conveniences. It’s quite a world we live in that we can sew clothes by hand and make bread from scratch, all while talking on a mini handheld computer known as a mobile phone. 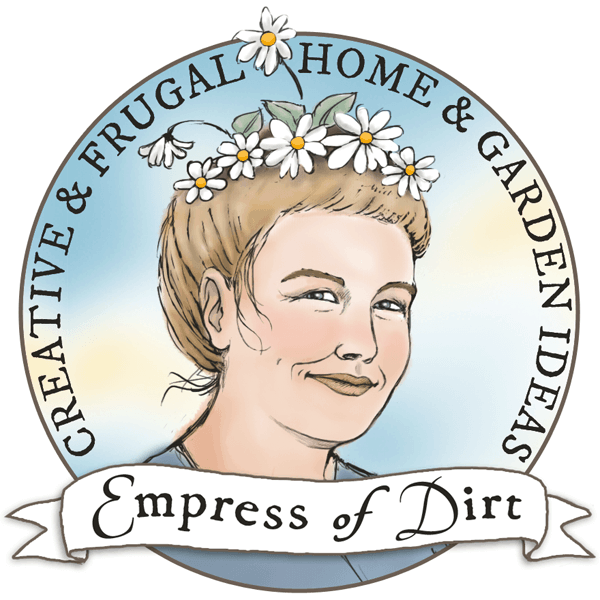 By 2005, I was ready for a change, and turned the blog into Empress of Dirt, with a new focus on my main love: life in the garden. It was Johnny Cash singing Hurt by Nine Inch Nails. If you are familiar with the lyrics, you may see how it struck me as a good name for a blog about (mostly) a love of gardening, frugality, making-do with what we have, and the contentment we can only find in nature—all sprinkled with a healthy dose of life-is-short, and we are stewards, not owners of this earth. I hastily made up the logo with Queen Victoria as the Empress, thinking this would be temporary until I came up with the ‘real design’. I never anticipated it would take 12 years to get it done. With no particular design or technical skills, I finally had the good sense to hire someone who does. Alice Priestley is a ‘web designer / front-end developer with a background in book illustration‘ and the person who was able to turn my seemingly unrealistic dreams for this site into reality. 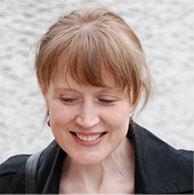 Alice provides the story of the creative development process here. Basically, I uttered some far-out ideas about the look and feel I was hoping for, and Alice disappeared with her magical sketchbook, fine coding skills, intuition, and a lovely determination to push the boundaries, and came back with something much better than I could have hoped for. In this era where a website must serve a tiny mobile screen and at the same time look right on a giant desktop computer monitor, it is no small task to design something that is playful and engaging yet technically proficient. Alice managed to capture the old-fashioned storybook feeling I was after yet still meet all the demands (and confinements) of a blog. I could not be more pleased, and, I hope, of course, that you will enjoy it too. To explore more of the new artistry on the site, and see the Empress come to life, have a look at Grow, Make, and Ideas. 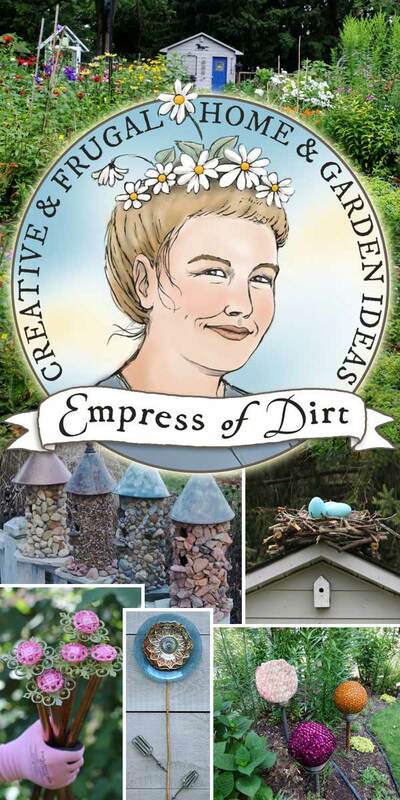 To find out who is the inspiration behind the Empress of Dirt character, you will enjoy Alice’s story here. And thank you, Alice, for a beautiful new Empire of Dirt. I love your new look and that beautiful bee flying around! You are so creative, Melissa, and Alice most definitely captured what you are all about. Thank you so much, Esther Suzee! I’ll be sure Alice sees your note. I love your delightful new ‘look’!… I always look forward to your newsletters. You’ve inspired me to try many of your creations to add to my garden and to give away as gifts. Just have to give a big shout out for you. The new look is awesome and entices us readers to keep on following and keep on being inspired by all things you do. I always enjoy reading your newsletter and the lovely ideas you share with all of us. Lovely to hear, thank you, Kathy! Love the new design and artwork!! Love all of your ideas as well! Thanks for informing and entertaining us! I look forward to your newsletter every two weeks, Melissa! I’m not the most creative person in the world, but the projects you have in your newsletter are ones even I can do! Keep up the good work. I love the new website! Just what I love to hear! Thank you, Dana! I look forward to every email I get from you! We are currently selling our 1870 home (after41 years) and building a completely modern home! I’m looking forward to adding lots of cute ideas to the new garden! It’s so tiny compared to the other yard! The front has to be our Adult garden but the back will be all me!!!! I love the fun stuff!!! Thanks for what you do! Love the new look. Fantastically refreshing! Love the “new” you Melissa! Alice & you have created a ‘Wonderland’! So glad you like it. Thanks, Sue! There is nothing like having fun with being creative in the garden and getting all that energy from the earth! I always smile when a new email with your ideas comes in. 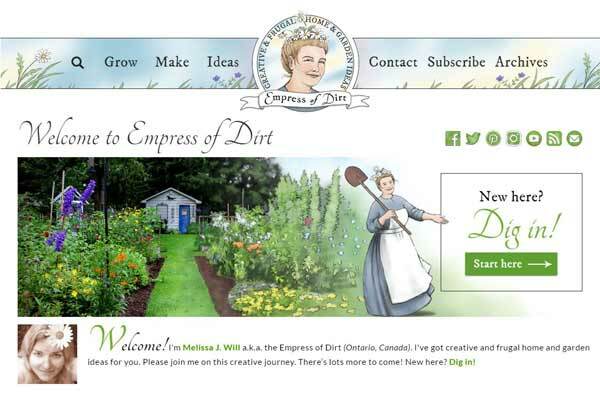 Love the makeover, although I did get a kick out of the queen with daisies on her head! Love all your creative ideas too! They help stimulate MY ideas!! “For everything there is a season…” Carry on! The new website is enchanting, Melissa! The animation is delightful! Alice did a wonderful job and I so appreciate it. Nice to hear, thank you, Janet!